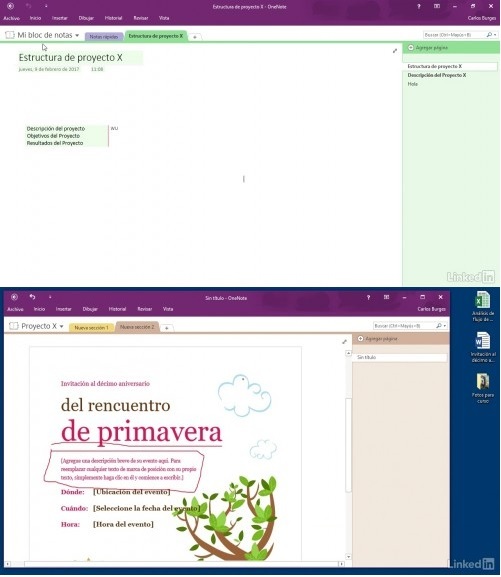 OneNote 2016 from Microsoft is a note-taking application available on multiple platforms that has become a real service and in this course you will learn how to get the most out of it with a series of tips and tricks that will allow you to make notes practice , comfortable and productive not only using the application's own features. Learn to structure the information so that when it comes to recover it is useful for the task that was intended. OneNote is more than a note-taking software, it is a service available on all platforms with content synchronization that offers you the possibility of creating rich notes for any context. OneNote is available on all mobile platforms, so you do not depend on a computer to continue working with your notes wherever you go, as it is available for the iPhone, iPad and also for Android devices. Take a few simple notes is easy. Creating content that is really useful to you is a totally different situation. We will focus, following the idea of ​​our project, in the creation of quality content.